I remember as vividly and clearly as if it were yesterday that hour in my bedroom loft in my newly built house. Backbreaking months were just over. I had undertaken the maddening attempt to build an ecological house without possessing the necessary financial resources. I had trusted that the laws of manifestation, on which the Findhorn community is based, would also operate in my case. The law of manifestation is a universal law. It instructs us how to bring a thought, an idea or a concept into material reality. You will hear more about it later in this book. It did not take long to find out that the practical application had its pitfalls. Despite all my efforts, all possible sources of finance had been exhausted towards the end of the building project. I could no longer afford to hire my builders. I had to take on part of the interior work myself. In no time I acquired new skills, like painting wooden frames and floors, tiling, and sealing walls. Time ran short. The summer was close, and I had hoped that many guests would stay in my new B&B. Just in time for the pre-determined deadline, on my 45th birthday, I opened up the guest house. Now I was sitting in my loft, looking back at the months that I had just left behind. Those months had been filled with struggles and doubts whether I would manage to generate the money for the materials and salaries in time. On top of all the work in the house, I had run seminars, developed models for a new integration of the Findhorn community and negotiated between its different parts. I was used to doing several things at once, but this combination had exceeded my capacities by far. I had repeated the pattern of a lifetime, knowing that I was repeating it. I had overstretched myself to the point of total exhaustion. This time I had done it so thoroughly that I had reached bottom. Gain and loss cancelled each other out. If we reach the bottom of a pattern, we come to a choice point. We can continue our behavior until we start to destroy ourselves, or we shift and choose a road that takes us out of the pattern. The decision at this point is up to each one of us. If you had the choice between joy or drama in your life, which would you choose? You would probably say joy. But think about it. Would you really be willing to give up your drama for the sake of joy? Or do you think that joy and drama can exist side by side? They cannot. Drama and joy exclude each other. Drama is fed by feelings of self devaluation, suffering and failure. It confirms one's notion of worthlessness and legitimates oneÕs suffering. Drama is like a downward spiral which takes us ever further into the swamp. The further and deeper it grinds down, the more it has the character of a self-destructive addiction. For many people their life drama is the basis of their identity. Their aim in life is to gain recognition for the suffering they have endured. This is a very human and legitimate need. The problem with drama is that recognizing the suffering does not cure it. On the contrary. The knowledge that it gets you attention and compassion from others gives the drama additional value. It becomes a tool for gaining affection. The drama is thereby strengthened, and it becomes even more difficult to free yourself from its grip. For many people, their daily small catastrophes are also a way to feel alive. Sometimes it is the only way they know how to feel alive. Drama is fed by the intensity and high voltage of oneÕs feelings. The real changes mostly come in small and inconspicuous steps, and often you only notice them when you look back and realize that a familiar reaction no longer affects you. Instead of jumping up when your colleague makes a pointed remark, you suddenly notice that she is not well and that her comment has nothing to do with you. Instead of sinking into self-doubt and shame when somebody criticizes a particular behavior, you suddenly feel at ease. You may even feel grateful that somebody has pointed out your lack of awareness. I often see people in my practice who cannot even imagine how it feels to be alive without running on high voltage. The joy that emerges from the stillness and fills the inner being appears boring in comparison, especially if the experience is not at first accessible and must be developed through daily practice. One must have faith that this daily practice will guide one out of the swampland, especially when success is not immediately noticeable. Your best chance of success comes when you arrive at that point in life when you are tired of the drama, and the drawbacks of suffering have become stronger than the goodies you get from it. I call this the choice point. The pull of the drama and your self-destructive part is balanced by your desire to live a fulfilling and rewarding life. If you can say one hundred percent yes to life, the scales will come down in your favor. Then you switch from a downward to an upward spiral. Your work is not yet finished, but it becomes a lot easier because satisfactory experiences now accelerate the upward movement. At this point we not only look at how to overcome suffering but also how to expand joy. If you pay attention to repetitive patterns in your life, you will probably notice that a particular theme keeps coming back and that it extends from small to big events. For example, if your challenge is to feel betrayed or taken advantage of by others, you may encounter such situations when you go to the bakery to pick up rolls, and also in your personal relationships and in financial agreements with business partners. In the course of life you throw light on such a pattern from different angles until you deeply understand them and are willing to let them go. Earlier in my life, I had often wondered why the same kind of incidents continued to happen to me, despite all my precautions, insights and changes. My personal story was a chain of wrecked relationships with men. In the course of time, as I pondered on the repetitive nature of these events, I became aware that life confronts us with particular lessons which appear in different guises. They are key events which point us the way to our inner core. Since these events are often painful and entail a lot of suffering, I found it first impossible and then difficult to perceive them as positive. From my own work with many clients, I know how resistant people are to the idea that their material, emotional or mental misery may be a reflection of their world within and a signpost to the true self. It seems much simpler to blame others for it. However blaming others does not save us from the suffering. If we take on responsibility for our agony and misery, if we therefore accept ourselves as the creator of this condition, then we may accept that we can just as well create a good and fulfilled life. We can choose to do this with grace and ease or effort and torment. Many people in our culture believe that something is only worthwhile if it takes effort and work. It is as if they need sufficient agony stamps before they can grant themselves the good things of life. We need to become aware that this thinking is part of our Christian inheritance and is not the law of the Universal Mind. In the conscious universe, the responsibility is laid in our own hands. In this context responsibility means freedom, the freedom of choice. I found two books which broke new ground for me: Vernon WoolfÕs 'Holodynamics' and Michael TalbotÕs 'Holographic Universe'. They explore the power of holograms, inner images, that influence or even determine the course of our lives from the Unconscious. A hologram is a three-dimensional picture that looks like an actual object. However, you can walk right through it. It has no physical limits. A hologram is produced by a pure light source, like a laser beam, which is split in two by a beam splitter. The first beam reflects off the object, in this case let us say an apple, onto a photographic plate. The second beam reflects off mirrors onto the same photographic plate. Both beams together create criss-crossing wave patterns. They are called interference patterns. Imagine yourself throwing two stones into a pond of still water, making waves which ripple outwards and cross each other. They create a pattern of wave mountains and valleys. This corresponds to the interference pattern of the two laser beams. When you let a third laser beam shine through the interference pattern on the photographic plate, a three-dimensional image of the object appears on the other side. This is the hologram. The interference pattern on the plate contains many sections of the photographed object or situation. According to the angle from which you let the third laser beam shine through the plate, youÕll receive different images of the object or event. If you apply this phenomenon to a human being, the third laser beam corresponds to your intention. Depending on your viewpoint, aspiration or desire, you create a different reality. If the viewpoint is impregnated by suffering, you create a different reality than if you were to perceive the same situation from the angle of joy. The popular language expresses this phenomenon in the image of a half-filled glass. The pessimist describes it as half-empty, the optimist as half-full. What we perceive as reality is not the only possible reality. Pointing to a different view, quantum physicist David Bohm describes the interplay between unfolded and enfolded orders. What we see and experience as ÔrealÕ, which is the unfolded order, is basically an illusion. It is comparable to a holographic picture. Underneath, there is a deeper level of existence that extends itself beyond time and space. Examples of the existence of a deeper level of being that lies beyond time and space are to be found in the psychic phenomena of clairvoyance or intuitive knowledge. You may have had a personal experience which leads you to credit the possibility: perhaps of thinking about somebody from whom you had not heard in a long while, and the next day you get a letter from them; or you think of a person, and within the next moment you meet them; or suddenly, in an inner vision, you see yourself in another place, and a couple of years later find yourself in that precise spot; or if you enjoy working with plants, you may have experienced that they flourish better if you speak to them or please them with beautiful music. Carl Gustav Jung has called the coincidence of unusual events Ôsynchronicity.Õ The term expresses his belief that coincidences are not accidental. More than that, ÔSynchronicityÕ is a statement that we are all part of an indivisible whole, and that our thoughts, attitudes, desires and intentions set things in the material world in motion and apprehend events beyond time and space. What you think and do has an effect. When your heart is filled with rage and hate, it has an effect. It will draw those vents into your life that confirm your right to be angry. When your thoughts are filled with fear, you will draw into your life what you are afraid of. The good news is: the same is true for the positive side of life. When you fill your heart with joy and love, you will draw those qualities into your life. It is up to you what you want to cultivate. You cultivate what you think. You may need to mature inner images that are associated with painful childhood memories to shift your frequency from suffering to joy. These inner images or holograms consist of thoughts, feelings and body sensations that we associate with certain people or situations. They steer the course of life from the Unconscious, in despite of all our good intents and keep us in a familiar chain of suffering and stagnation. You may know the story of the man who was fed up with carrying his cross around any longer. He went to a shop which had many different crosses in its stock, and offered his cross in exchange. "That's okay", said the shopkeeper, "Just look around and select a new one." He walked around and tried many crosses. One pressed here, another pressed there, one was too heavy, the next too thin, the third too worn, the fourth too new. After a long search he finally found a cross that was tailor-made. Glowing, he went to the shopkeeper. "IÕll take that one", he said happily. The shopkeeper agreed, nodding his head." This is the cross you came in with." When you are tired of wearing your cross any longer you will find a broad spectrum of suggestions and instructions of how to let go of your cross in the full version of the ebook: Beyond Suffering. You will find an overview of the content after this section. In the book I explain in a language that you can easily understand how you construct your reality. This understanding is based on modern physics, research about the functioning of our consciousness and Eastern traditions. With this knowledge you can create a reality that is in alignment with your needs. 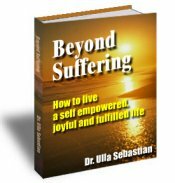 The full version of the book "Beyond SufferingÓ includes a manual with detailed instructions on how to track a body symptom, a problem or a life-depleting pattern, how to understand the higher purpose and to preserve the gift of this lesson in a new and positive form. Using these techniques you can overcome old wounds and traumatic experiences. The book teaches you how to access your higher Self to draw forth what you would like to manifest and how to use the breath to flow with the rhythm of life. The book explains the creative power of the mind and the law of resonance and provides detailed instructions of how to draw those qualities, goods and people into your life that will make your life fulfilled.